The Rosary seems to many an outdated mode of pietistic expression — Hail Mary after Hail Mary repeated in an endless litany, often in slumber, half alert and redundant — and yet it is one of the Church’s oldest Marian devotions. It’s history is entwined with human events that include victory in battle, heresy, succor in famine and plague. Countless saints and blesseds have traveled the road to heaven beaded cord in hand, and to this day, consecrated men and women do the same. The lay are also given this string of beads to make of them the fragrant offering of prayer which most resembles the living faith we meditate on using them — for in the passage of each decade, the whole story of salvation is rendered before our minds and hearts in a litany of blessing and grace. The mysteries of the Rosary are a Christo-centric meditation: invitation extended us to near closer to His very life, through the steps His Mother took alongside Him. In venerating her, we render her the honor due the one who is Mother of God. 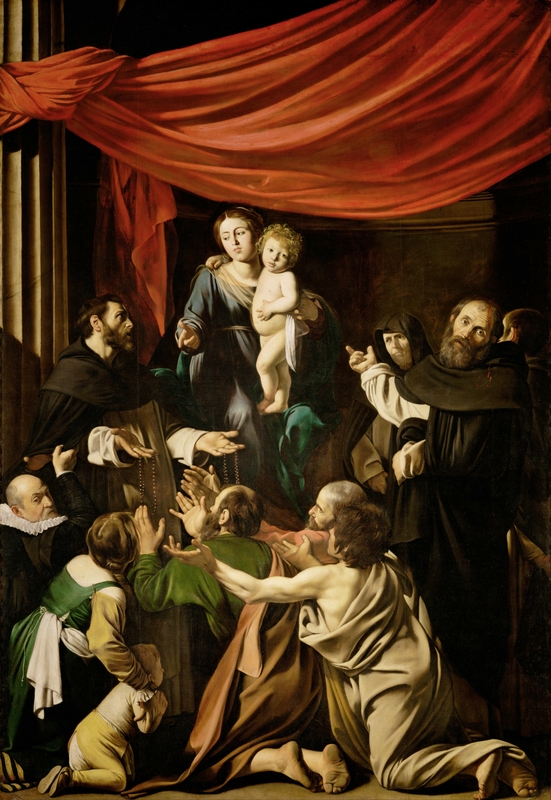 And it is so, that among the many devotions of the Church, the Rosary stands apart as that shower of joyful praise, which makes our own that canticle the divine messenger Gabriel visited her with, saying, ‘Hail, full of grace!’. now stood before her with his wings extended. as star of morning by the rising sun. And ever since that moment, when Heaven visited earth and became flesh in Christ, each rose of prayer laid at her feet forms one long cord of hope, which unites present misery to the long awaited redemption that found a worthy and fragrant vessel in her womb. No longer lonely is the world below. The beads of this joy continue to fall upon the earth, while the saints rejoice, and souls heaven-bound return on pilgrimage, anchored by the cord to paradise. On this, her feast, may she intercede for yet wandering souls. Salve, Virgine Rosarii, miserere.